Tossed from Metairie, Krewe of Zeus Withdraws their St. Charles Parish Application! Update! Zeus has withdrawn their parade application after the solicited email response was 70% against the new parade. After losing their parade permit from Jefferson Parish, the Krewe of Zeus may surface in St. Charles parish. St. Charles doesn’t has a new parade ordinance with teeth like Jefferson or Orleans. The krewe had just two marching bands in its 2014 parade, three shy of the minimum, and it also had too few floats, Jefferson parish officials said. Jefferson’s ordinance requires Carnival parades to have at least 10 floats, not including those for the captain, grand marshal or royalty. Zeus’ initial 2014 plans indicated 12 floats, but it rolled with only 11, including those for the king and grand marshal. Five years ago, Metairie had 14 parades, today there is only 9. The Krewe of Zeus has applied for a permit to parade on River Road and Ormond Boulevard.The parade’s proposed route would travel west from Ormond Plantation on River Road to Ormond Boulevard, then north to Greenwood Drive, where it would turn around on Ormond Boulevard and retrace the route. Founded in 1957 at Gennaro’s Bar from the minds of 6 drinking men and a pair of dice. 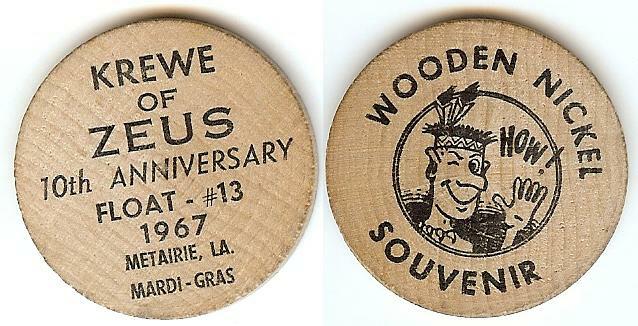 In 1958, the Krewe of Zeus would stage the first night parade ever in the burbs “The Realm of Mother Nature”. And with rented costumes, and rented floats, and led by search lights in the sky with William Dwyer (co-founder) as King, the Krewe of Zeus would roll down Metairie Road with 150 members. The parade would last some 5 and 1 half hour long, the men stopping to toast at every drinking establishment along the way. And from this all male Krewe would emerge an unparallel Metairie tradition & Celebration that has lasted over 5 decades in the heart of Jefferson Parish. From the first viewing stands for children with special needs, and the Drachma; to the predominate start of the Irish Italian Parade and the only Metairie Krewe to stage two parades in one season. The men of Zeus have shown innovations (often copied, but never duplicated) that truly earn them their motto: “Second To None” And after 55 years, you’d be hard-pressed to find a better group of guys with love & loyalty for their Krewe! The Times Picayune’s headline yesterday states the Krewe of Zeus wants to leave Metairie route. Nothing could be further from the truth. Zeus lost their spot in the Metairie parade schedule. They aren’t banned from parading in Metairie in the future, but they must correct their deficiencies first.